Smartly located right in the heart of Dublin city, The Westbury is just a 2 minutes walk from the elegant shopping and business districts along with other city attractions. The Westbury has graciously played a regular host to a number of diplomats and celebrities from all over the globe. 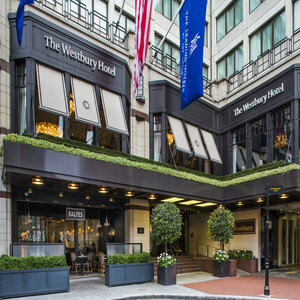 The luxurious 5-star Westbury Hotel is located in the heart of Dublin's best shopping street- Grafton Street - Dublin 2 Ireland. The hotel offers wide range of bedrooms, each room has Sealy beds, Lissadell linen, and Aromatherapy Associates bathroom products. They also feature LCD TVs and an iPod compatible music system. The 5 star luxury Westbury Hotel in Dublin 2 Ireland offers an array of dining options, including the Balfes brasserie and Wilde Restaurant. It is a vibrant all-day bistro with a 20-seater outdoor terrace, a zinc covered bar and an open kitchen serving beautifully prepared dishes. The Marble Bar is one of the perfect places to enjoy a post-work martini or a pre-dinner glass of champagne, sipped by an inviting open fire. The luxurious Westbury Hotel is located only a short journey away from Dublin's Grafton street, Temple Bar and live music venues such as: the 3 Arena, Bord Gáis Energy Theatre, Gate Theatre, and Abbey theatre and many more. It is in great location in Dublin city cetre if you are attending a live concert and event. You can enjoy watching your favourite sport action on TV while relaxing. If you would like to attend sport venues in Dublin to support your beloved team, this place is an ideal Dublin city hotel to stay as the sport venues are just a few minutes from the hotel, such as: Aviva Stadium or Croke Park. The hotel offers great facilities for any events, its boardrooms and the palatial Grafton Suite can accommodate up to 220 guests. They are all equipped with the latest conferencing technology, the rooms can be adapted for a wide variety of business and social events as well.